Amy Wray Irish earned a BA in English from the University of Iowa , then attended the University of Notre Dame, where she was Managing Editor of the Notre Dame Review and a teacher of undergraduate poetry classes while she earned her MFA in creative writing. She now lives in Colorado with her husband, also a writer, and their son. Amy 's work has been seen in 100 Words, Apocalypse, Ariel, The Bend (formerly Dánta), Neologisms, the Notre Dame Review, Poetry Motel, River King Poetry Supplement and Wazee Journal. 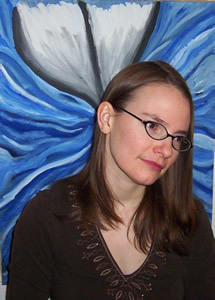 She was featured poet in Wazee's Spring 2003 edition and won 1 st place in Chicago 's Hirshfield Memorial Poetry Contest. Amy's novel-in-progress, titled Her Fertile Crescent, is set in ancient Iraq amidst goddesses, belly dancing and sacred sexuality. Amy 's chapbook of poems and art --- Creation Stories --- from Green Fuse Press released last spring sold out in one day! Please check out www.myspace.com/amywrayirish for more information or contact her at lunablue_girl@msn.co.